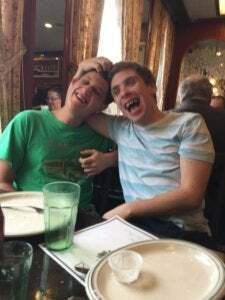 My son has Fragile X Syndrome and I often felt sad that friendship — which I value enormously — was something Julian didn’t even notice. He didn’t miss it; I missed it for him. After all, wishing for friends for your kid is pretty universal. Inclusive schools and communities are great on a societal level, but maybe not enough on a personal level. If we wait long enough, will our kids eventually find friends on their own? Is there more we can do to encourage the development of friendships? For my son, the answers to both questions are “yes.” But it took parental effort–and luck. Was the effort worth it? Definitely. Maybe you can learn from Julian’s story. Over the years, we’d ask Julian which kids at school he liked and was there anyone we should invite for a playdate. He always said “no.” There was a young man whose mom and I hoped to encourage a friendship between the boys, and we had a few outings. But the other young man was more socially savvy and found my son embarrassing. Julian always enjoyed himself on group outings but individual friendships with his peers did not emerge. That is, until he met Jonah. Their friendship is the impetus for this article. They’re happy. And both families are happy. I wanted to share the story of how their friendship developed, mostly to reassure you that it can happen. But not without some parental manipulation. That may feel unnatural, even uncomfortable; most of us found friends without our parents’ help. But parents of special needs kids continually adapt to our new reality and must discard assumptions that their lives will just replicate our own. That applies to making friends as well. It’s hard to extrapolate a simple How-To from Julian and Jonah’s story. They met at an overnight summer camp with a special needs program; such an experience away can itself be a great spur for kids to try new things. The boys were in the same bunk several summers in a row and credit goes to their amazing counselor, Abe, who told us when we picked Julian up one year: “You know, there’s another kid in the bunk with Fragile X and the two of them have so much fun together.” That was nice to hear, and we assumed Jonah probably lived somewhere in New Jersey; but we didn’t think to track him down. Happily, the Fragile X New Jersey group hosted a pool party a few weeks later. As we got out of the car, Julian yelled, “Hey, there’s Jonah!” I feared he’d run in the other direction to avoid having to interact. To my surprise, he instead ran straight to Jonah and the two remained together all afternoon. I was amazed, as was Jonah’s mother. I believe we said in unison, “He’s never done anything like this!” We exchanged contact info and knew this was something we should encourage. 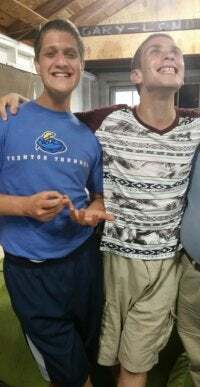 That’s how it started: The boys bonded independently at camp and were happy to find one another at the party. But it was the next step that mattered: We moms took the reins and made their friendship a conscious campaign. It began with short visits to one another’s homes, over an hour away. The first trips weren’t easy. Jonah didn’t want to be at our house; Julian soon wanted him to leave. When we arrived at Jonah’s, he’d run to another room and slam the door. Once when Laura’s car pulled up at our house, I was sitting on our deck and called upstairs to Julian that Jonah was here. Jonah wouldn’t get out of the car. Julian wouldn’t come down. But we learned to wait out their initial reluctance because quickly they were having fun together. We started doing it monthly, and on perhaps our second visit to Jonah’s, both boys seemed to realize how great this was. One said, “Could we have a sleepover?” The first overnight was a challenge too, but now we’ve done it almost monthly for about eight years. There’s always a meal out (both boys love restaurants), sometimes theater outings or baseball games or train rides. Their very favorite activities are eating and watching TV. They make funny noises together. They exchange odd gifts. And though both hate talking on the phone to anyone else, they occasionally FaceTime. And as the boys became BFF’s, our two families have bonded. There is hope for growing friendships among our children. But it won’t happen by itself. Do more than just encourage and hope. Find an ally in a parent who has the same hopes for their kid. Get involved. And stick with it. It can be a real source of joy for both the kids and the parents who love them. Susan Cohen is Julian’s mother. She is a guest author for the site, hoping to inspire and spark hope in other Fragile X parents and caregivers. Jonah’s mother, Laura Waters, both encouraged and edited this article.